Tuarua Fiji, is stepping down and a new owner is taking over. More on this as we learn from Tuarua Fiji's management. It is with great regret and sadness, that I have to let Tuarua Fiji go, I have had a big life change and cannot put 100% of my time and attention into the estate as I would like. I feel defeated in writing this notice, please see the attached note card for further information. I will be posting another notice soon with new contacts, etc. 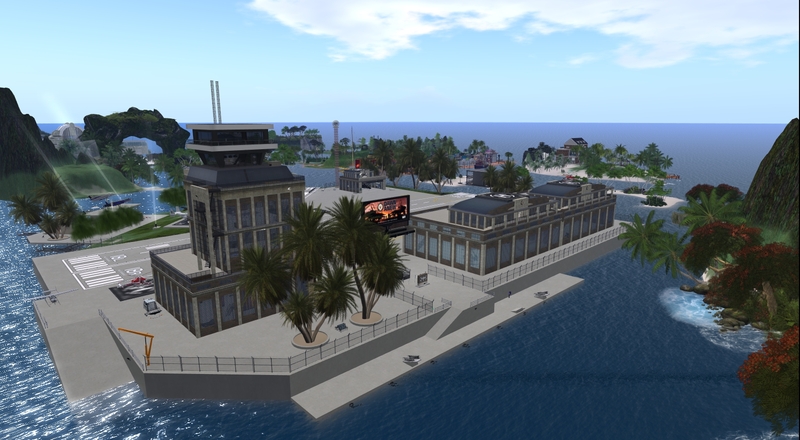 NAS Miramar is safe as it stands on its own sim. The questions remaining concern the new owner's philosophy and how well will the region's free flying and sailing status will be preserved. NSV/NSTC - Main Gate. 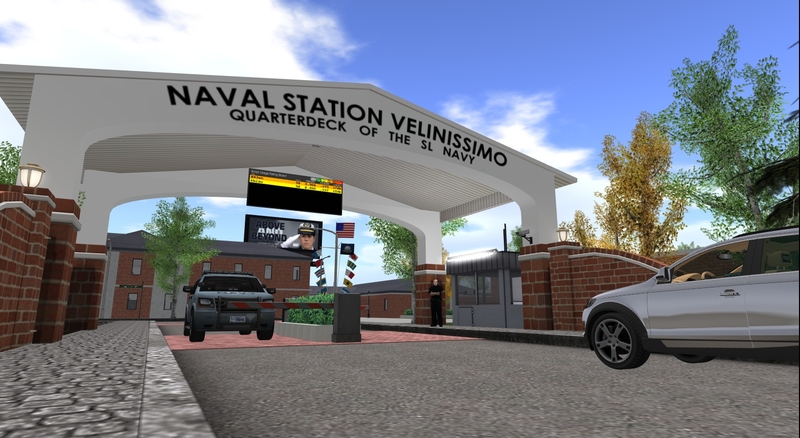 The Quarterdeck of the SL Navy. 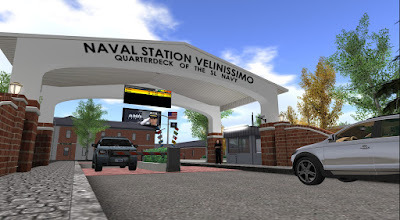 Effective immediately, midshipmen/cadets Quint FiftyFive, Fire NewYork, Allan Smith and Noah Rhiano are transferred to Naval Station Velinissimo's Naval Service Training Command (NSTC Nautilus) for in-processing and basics course. Upon completion they will be given the deployment options and if recommended and willing, advance their training at Miramar or serve in any of the local squadrons/units. Report to Master Chief Cameron Duncan, NSTC Nautilus, or Captain Isaac "Izzy" Harcassle, NSTC Nautilus/NAF Avignon. In-processing for enlisted recruits and officer candidates begins 27FEB16, at 1000 SLT. Recruits and officer candidates who attend will receive their NSTC group tags, issued initial uniforms, and be given a brief rundown of basic training. Be advised that this will be the first scheduled in-processing session at NSTC. However, in-processing will be mostly unscheduled from this point forward, as members' schedules differ. Make us proud and earn your way back. Hooyah. It was brought to my attention that some crew members feel awkward being at Miramar off duty. Please don't. NAS Miramar is open to all, as you know, and "all" are not on duty US Navy SL personnel, so feel free to hang out at Cougar's, bring your friends over or just relax at the Station. More to say on this but for now just a tip: if you clearly are not on duty, practice or mission able, remove your NAS Miramar tag. You can still be off duty with tag and uniform on, though you usually wouldn't. When in doubt, imagine the situation as taking place in real life and ask yourself "what would I do?". 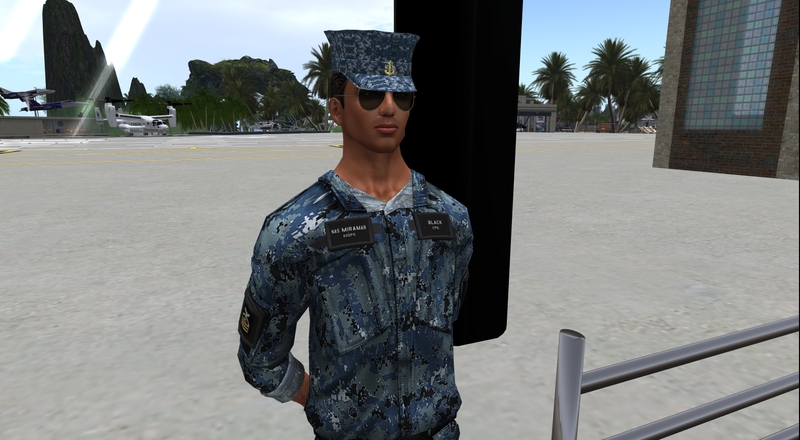 Chief Petty Officer Black in his digital ACU, manning the main gate. CPO Black will show up in several locations around NAS Miramar, wearing several types of approved uniforms. Some have optional add on's. He is not a real person, so don't mind his manners. If you outrank him he may at times stand in attention and salute you, but for the most part he is just monitoring and showcasing uniforms. Among other much needed things, the complete list of mandatory (first) and optional (later) uniforms will soon be available from this website, complete with links to the Market Place pages where you can acquire the parts that are not standard issued. As possible, standard issued items will be made available. Full configuration demo flight, January 2016, over NAS Miramar. Fat Albert and Angels 1 through 6. The Navy Flight Demonstration Team (NFDT) is the most famous squadron in the U.S. Navy and its calling card, at home and abroad. 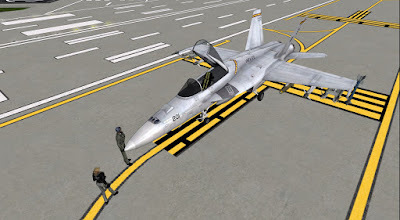 Just as in real life, USN SL has its Angels and we will keep you posted on the squadron's status, composition and shows right here at NAS Miramar website. The NFDT is stationed at Naval Air Facility Eagles Nest (NAFEN), CDR. Kuhn's command. * CDR. Vickster "Speed" Kuhn, Angel One, is also Miramar's NFWS lead instructor (Top Gun). This is an ESSENTIAL SCM for all of you. Please read it through CAREFULLY and comply to ALL its requirements. I understand most of you have no naval training but I have been going out of my way and spending a lot of time on reports and memos, both in group notices and on our website so you can be up to speed. I am taking that to a new level with this note. 1. Go to your NAS Miramar group window and look in the NOTICES tab, organize them BY DATE so you get the last ones ON TOP. Read your notices. 2. Go to your NAS Miramar website and check the last updates. If there are changes in the special sections - not visible on the normal post view - you will be notified in Group Notices AND via a post on the website to go check the changes out. READ all the Reports and Memos CAREFULLY. 3. Make sure you have your USN uniform on when coming to Miramar. If you have been assigned a GridTalkie set (GT) make sure you have it as part of the uniform you wear. MAKE SURE YOU HAVE THE NAS MIRAMAR GROUP ON BEFORE YOU SUIT UP IN UNIFORM. If you do not you will break the GT link and it will auto-detach. 4. When you arrive at NAS Miramar for duty, hail the Station in the Group Chat AND on your GT channel 11 (( NASM operations channel )). That way you know who is online and on duty. 5. Talk to your fellow commissioned and enlisted officers, see if they know something you do not. Keep yourselves informed and help each other through any difficulties. 6. What you have been taught, from Navy procedures to item editing and adjusting, you pass along. It can take up to 2 full hours to guide someone who never edited a cube in SL through a ACU patch editing. Share your knowledge, what you know and what you have learned. 7. Don't know what a "Bounce" is? Don't know what a GT Channel is? Don't know what NAS means? First off: GOOGLE IT. Google is your friend it will answer all your questions if you are asking them right. Want to know what a Bounce is type "bounce navy practice" in Google. You will find your answers if you ask the right questions. 8. 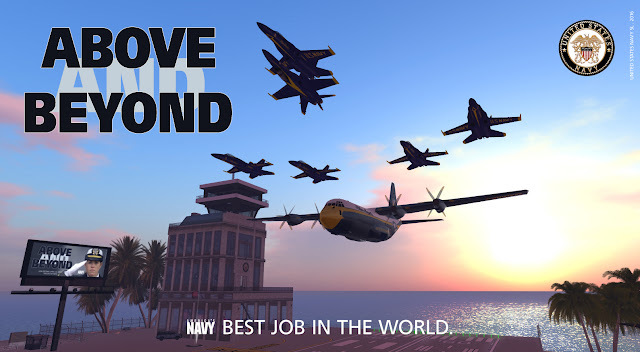 Life at Miramar is that of Navy personnel in a Naval Air Station. You are to carry yourselves with respect for the US Navy institution we mirror, this is not some "Shoot'em Up" role play sim. 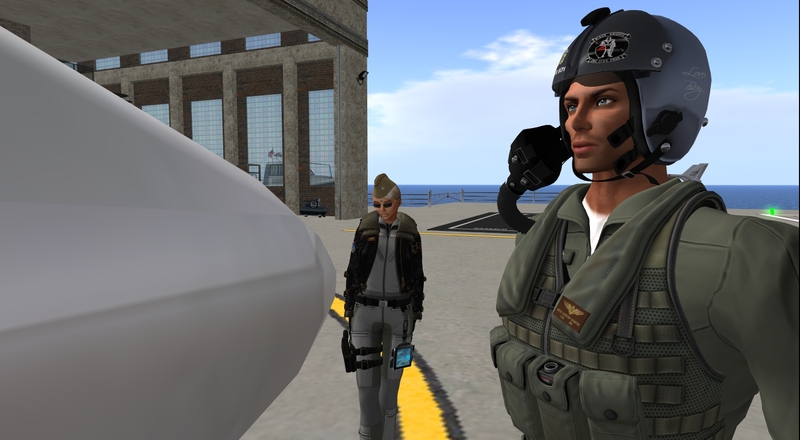 This is a United States Navy role play sim and we are always in check. It's as real as it gets. 9. Salute your superior officers. Wait for their dismissal, stand at attention until told to stand at ease or as you were. NEVER salute a superior officer while sitting down, stand up and salute. USE the military HUD. USE the NAVY features in that HUD. Add the military HUD to all your uniforms EXCEPT the flight suits in FLY versions (( FLY outfits are outfits you SAVE AS over your regular versions and strip of any excess and all non essential HUDS when flying - you SAVE AS once you have taken those out and just add the word FLY to the outfit's name )). 10. Take your time to go through all the information already posted on this weblog and the info that will be posted here regularly. The weblog is your best source of information. KNOW IT WELL. For the purpose of being informed, there is a place on the front page of the website where you can insert an email of your choice and submit it so you get all the updates in the mail. You will find it at the bottom of the right hand column, below the Blog Archive listing. More to follow, but for now, stick to these points and get them to be second nature to you. And be prepared to school the new arrivals on them. You are here because you got tired of other places "always the same" action and "whatever" attitude. This is the US NAVY SL and Miramar is its elite. You wish to be normal go somewhere else. We are exceptional. WOC/T2 Assessment is to be carried out throughout the coming weekend. Cadets are to report to the NASMCO for evaluation, schedule your times with CDR. A. Kron as soon as possible. 3. GOTO NAFA. Navigate to NAF Avignon. Landing at NAFA ends this drill. One attempt. 4. CVN-68 Trap/Short landing. 2 successful landings on the USS Nimitz deck on 3 attempts. 1. CVN-68 Trap/Short landing. 1 successful landing on the USS Nimitz deck on 1 attempt. 3. Bounce set of 3 on NASM runway 18 L. Score and time evaluated. 4. NASM landing set of 3 over 80 score on runway 18 L. 80 score 3 landings out of possible 5. Upon completion of the WOC/T2 assessment the candidate will be V rated and assigned to HT-28 for rotor training. A new orders relay system will be implemented, effective February 12th, 2016, zero hundred hours. Named OSCO (Orders from Station Commanding Officer), these will be posted on the website for execution within the orders timeline. Remember to check the website regularly. It is highly recommended you should place this site on your watch list, so you get heads up on each update. That is the best way for you to keep posted on new and/or current events. note: Checking the website does NOT exempt you from group notices check. 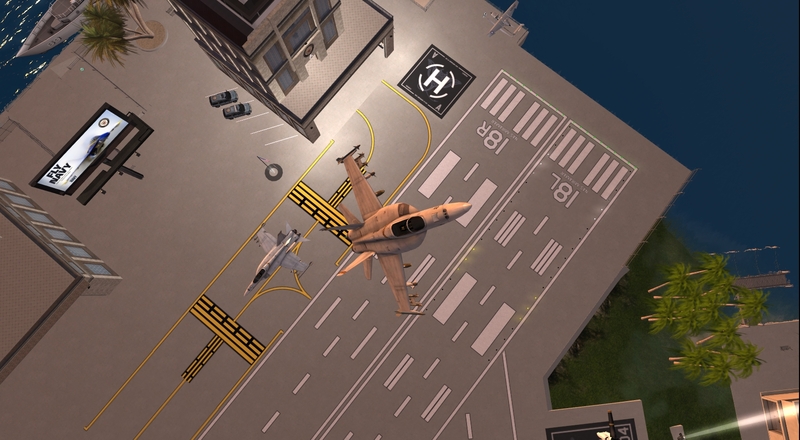 Following the downgrade of VF-154 to the trainer/armed trainer variant of the A-4 F, the efforts to bring the F/A-18 back to the squadron started immediately. Even if the decision was made out of the need to make VF-154 operational, having to retire the existing F/A-18 F's and C's with no upgrade of the same class was frowned upon by all NASM aviators, up and down the chain of command. CDR. Kron performs a power stall over Miramar with AE&W's A/F-18 X prototype. 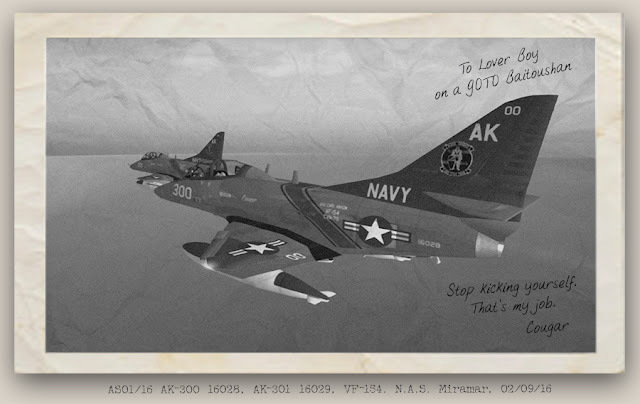 In the wake of this decision, AEB&W has decided to trust one of its prototypes to a Miramar aviator, none other than VF-154's squadron commander, LTJG. Mitch Spaartza. It turns out this prototype is the next block of AEB&W's F/A-18, one we will name "X" for now. It could not have come at a better moment. The F/A-18 X prototype evaluated at NAS Miramar. Improved frame and avionics. AEB&W's effort to upgrade its Block A of the F/A-18 were visible at first glance. 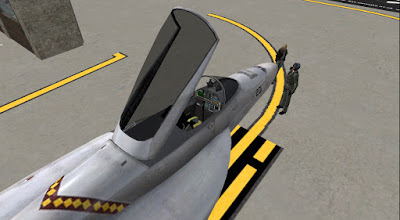 NASM command is proud that its aviators are called upon to test prototypes for several of Second Life frame manufacturers and engine developers. The station's condition and nature, along with the experience of its aviators, make this a very productive arrangement. The prototype was brought to Miramar during trials and flown by LTJG. Mitch Spaartza and CDR. Asra Kron, the initial impression being very satisfactory. LTJG. Spaartza will carry on a series of trials throughout this week, reporting his findings to the manufacturer/developer. LTJG. Spaartza sharing his findings with CDR. Kron prior to the duo test flight. 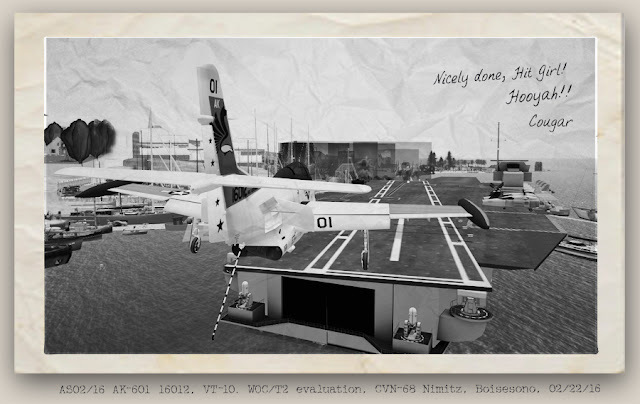 As it is to be expected, the results of all prototype trials carried out by NAS Miramar aviators are classified, so don't expect to read high praises or hard comments on any technical issues encountered during these tests. However, on a general note, and although the TA-4 J remains in front line service with VF-154 for the moment, it is safe to say upon the initial series of AEB&W's prototype flights that the Black Knights will not be without Super Hornets much longer. Junior Grade Mitch Spaartza, nick named after his call sign, as it is usual with VF-154 birds. Mentioned as RIO/Co-Pilot is Cadet Becky Sax, who would transition to VF-154 and assigned AK-303. 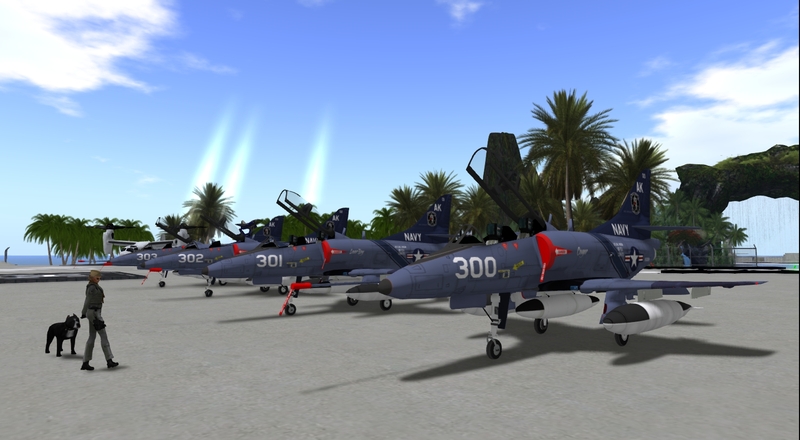 The A-4’s replaced the F/A-18 F’s and F/A-18 C’s that were to be the Black Knights mainstay due to technical issues involving manufacturer fleet compliance. US Navy SL requirements call for the used of the "armed version" of the TA-4 J, as an unlikely but effective substitute for the F/A-18 F's and C's. The TA-4 J in real life was a dedicated trainer version based on A-4F, but lacking weapons systems, and with down-rated engine, 277 built new, and most TA-4Fs were later converted to this configuration. The TA-4J Skyhawk model entered production in June 1969. It became the longest-serving of the Skyhawks as the US Navy’s standard advanced jet trainer until replaced in the early 1990’s with the T-45A Goshawk. The TA-4J descended from the Navy and Marine Corps single-seat light attack aircraft designed in the early 1950s by a team of Douglas Aircraft engineers lead by Ed Heinemann. The first Skyhawk prototype flew in June 1954. The Skyhawk was one of the most successful attack aircraft in US Navy and Marine Corps service. Single-seat Skyhawks were much used by Navy and Marine Corps squadrons during the Vietnam War. Its low delta wing of 27 feet 6 inches (8.4m) was small enough not to require folding on aircraft carrier decks. During service, the Skyhawk acquired several nicknames, including Heinemann's Hot Rod, Mighty Mite, Scooter, Tinker Toy, and Bantam Bomber. The full line up of VF-154 on February 5, 2016, at NAS Miramar. AK-300 to AK-303. The Black Knights are one of the three carrier based fighter squadrons nesting at Miramar and they were originally assigned Super Hornets. Much as we would like to keep an active F-18 squadron the reality is manufacturers have so far not answered US Navy SL requirements in place at NAS Miramar, preventing the correct display of each aircraft identity. Aesthetics aside, to have unique liveries, which display not only the aircraft unique BuNo but also the squadron ID and insignia - sometimes even the Aviator's - is a great visual aid when flying and, on a more personal note, nothing puts me off more than a formation of 3 or more exactly similar aircraft with no distinction whatsoever. It's just not good. After weeks of waiting and researching, I decided to submit Jade's Shana Carpool powered Douglas TA-4 J Skyhawk dual place to the consideration of VF-154 Sqdrn. CO and that of our senior engineer officer. After trials, and having established that the livery can be changed to meet our requirements, I have decided to park the F/A-18 F’s and F/A-18 C’s and equip the Black Knights with the TA-4 J. An initial batch of 4 has been ordered, BuNo's 16028, 16029. 16030 and 16031. The bird was also a constant at the real life Miramar, much more so than the F-18, so in a way, poetic justice was exacted. We will, however, keep pursuing the objective of having a fully operational Super Hornet squadron at Miramar. 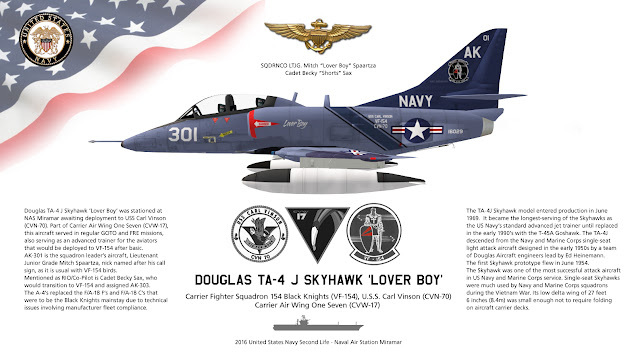 Note: See Douglas TA-4 J Skyhawk 'Lover Boy' for details. "There was a demon that lived in the air. They said whoever challenged him would die. Their controls would freeze up, their planes would buffet wildly, and they would disintegrate. The demon lived at Mach 1 on the meter, seven hundred and fifty miles an hour, where the air could no longer move out of the way..."
To achieve an environment where you could become what you dreamed of one day, and have a background that would immerse you in that dream as if it was real. We choose to be what we once dreamed of becoming, and chase the demon beyond what we imagined... To be Naval Aviators. Doing so in Second Life, using the mirror image of a real life institution as magnificent and proud as the United States Navy is a challenge we rise to. We honor the lives we mirror and serve with the respect we once hoped to in reality. The flag that waves above us at Miramar is as real as it gets. We remember that every time we suit up. This is U.S. Navy SL. And we are proud of it.